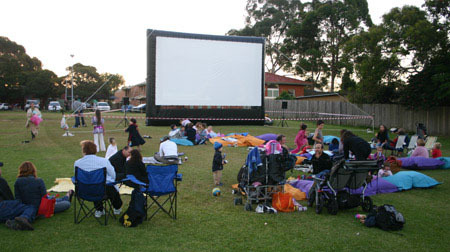 Have you ever wanted to create your own outdoor movie event but didn’t know who to contact? You have arrived at the right place! Big Screen Hire provides you, the event organiser, with all the required information to make an informed decision towards the size of screen, projection and sound system which will best suit your event. By talking to our Event Experts you will soon feel relaxed and equipped with knowledge on how to provide an amazing night of entertainment. Outdoor movies with Big Screen Hire are a fantastic way to watch your favourite films under the stars whilst either fundraising for a worthwhile cause or impressing clients. The team at Big Screen Hire will ensure your event is a success by supplying the top of the range; big screen, projector, sound equipment, event organisers and advice towards running an exciting and memorable outdoor event. Outdoor movies are a perfect way to bring the whole community together. The sheer difference of watching your favourite film in your local park is a great experience that will not only be appreciated but applauded. Such events are renowned for attracting strong media coverage and word of mouth promotion which is extremely helpful when trying to promote an event. Outdoor movies are ideal for fundraising events, product launches, information nights, music festivals, drive-in movies, film screenings and almost all outdoor events which need a major attraction. If you can find a location and an audience Big Screen Hire will ensure everyone is entertained throughout the evening. Choose a date and start marketing your event. Need a Big Screen Quote?